Reciting the Shema with the Prime Minister. 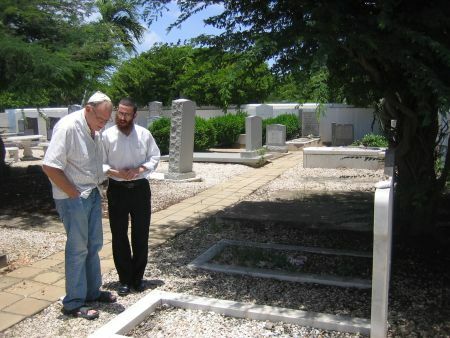 We were in Aruba, a small Caribbean island that is home to about 35 Jewish people. Sunday morning, we started with calling the "Jew of the island." Tony is his name. He knows everyone and everything and waits a whole year for the Roving Rabbis to come. Sadly, his eyesight is poor, and he suffers a lot from that, but he still came downstairs, got into our yellow compact car and said, "let's go." So we started off. "Go straight…now turn right…another right." Even with the little eye sight he has, he was able to direct us like a pro. Like he says, "I know the island inside-out." At last we arrived at the Parliament of Aruba, also home to the office of Mike Eman, the Prime Minster of Aruba, who is Jewish. As we were walking in, we naively asked Tony if we had an appointment. "No, no, we don't need any appointment. A few month ago I was with the Prime Minister, and we were speaking about you guys—he met your friends in the past when he was running for Prime Minister—and he said that when they come to the island this year I should just bring them in." We came to the secretary and asked if the Prime Minister is in. "He is in Columbia," she replied, "but will be back tomorrow." We got back into the car, and Tony asked, "Where now?" As per our request, Tony directed us to the Jewish cemetery where Tony showed us were his parents are buried. We said some Psalms together. Saying Psalms with Tony at his parents' grave. Bright and early the next morning, we woke up, studied some Torah, prayed, and were on our way to pick up Tony. We drove to the Parliament and waited for the Prime Minister to arrive. When he saw us, he came right over and invited us into his office. He sent a message to some people who were waiting for him that he would be a little late, and we sat down to speak for a while. We talked about his family and their Jewish heritage. He told us how he is planning on commissioning a monument for Anne Frank in Aruba, to remind people of the Holocaust and how we have to be tolerant of one another. We also spoke about the upcoming New Year and the shofar. He asked, "So did you bring the tefillin?" Of course we had them. So he put on the tefillin, said some prayers and heard the shofar. We presented him with "Towards a Meaningful Life," a book based on the teachings of the Lubavitcher Rebbe, of righteous memory. He asked us to keep in touch and send him the email addresses of the rabbis who had come in the past few years. Showing us a picture of his mother who had recently passed away. Right before we left Aruba for Bonaire (were we currently are), we printed pictures of our time together, framed them, drove back to the Parliament and gave them to the Prime Minister. He then placed them on the table in his office (right next to the photo of his mother). Then came—again—the tefillin and the blowing of the shofar. 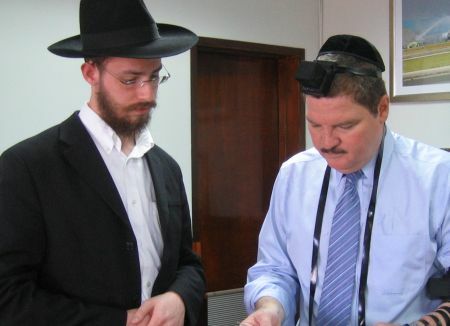 As we were preparing to leave, he asked that we arrange him his own pair of tefillin. 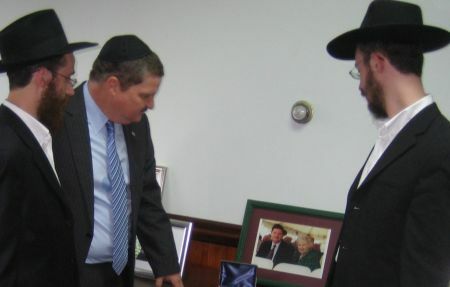 So if you're ever in Aruba and need to find a pair of tefillin, you can always get one from the Prime Minister! We hugged, wished him and the whole of Aruba a happy and sweet new year, and ran downstairs to catch our next appointment. 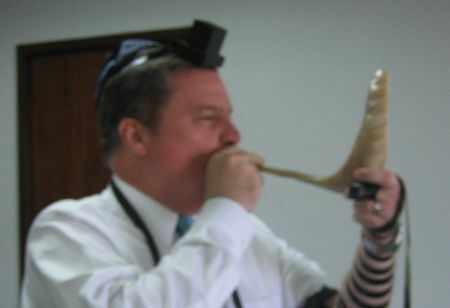 The Prime Minister trying his hand as the shofar. our meeting with Ravs David and Shua we are the two sisters, Rena and Fanny, that you met in Playa Linda. Meeting with both of you were one of the wonderful memories we shall take back to NYC. Continue to bring light and spirit to all Jews that you meet especially in the far corners of the earth where there are so few 'lantzman'. Every Jew is precious. Try to start a minyan in Playa Linda next year G-d willing. Perhaps we can have a kabbalat shabbos (Friday night) minyan next year. Wishing you and you families a 'shana tova' (good year) filled with good health and joy. This was back in 1999, when his older brother was Prime Minister. When I was hired, I asked Mike if I can leave early every Friday for Shabbat services at the island's little synagogue. He said "of course, my mom would kill me if I made you work on Shabbas." That's how I learned he was Jewish. She was an incredible woman and inspired me to keep kosher and become more observant. I'd love to share the whole story with you one day. Long story short - from Aruba I moved to Honolulu to LA to Portland to New York and now Hoboken. I've been with Chabad in all those places. But it was that time in Aruba that had the greatest impact on my Judaism. It makes me so happy to see Chabad making an impact in Aruba!